Powell residents and U.S. Navy veterans Martin Pickens, right, and Craig Carmichael, left, share a brief conversation following the city’s Veterans Day ceremony on Friday. Carmichael, a World War II veteran, was keynote speaker. Powell resident Craig Carmichael, who served in the U.S. Navy during World War II, speaks to a packed house Friday at the Powell Municipal Building Council Chambers. Carmichael reminded a packed house that freedom comes at a price and should never be taken for granted. During a Veterans Day ceremony held Friday inside the Powell Municipal Building Council Chambers, World War II Navy veteran Craig Carmichael reminded a packed house that freedom comes at a price and should never be taken for granted. 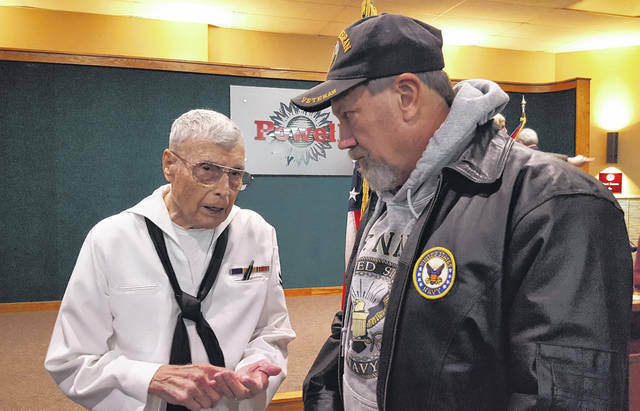 The 94-year-old Powell resident said the very freedom he fought for back in the 1940s is constantly tested by foreign and domestic enemies, and he called upon all Americans to unite as one. As he closes in on his 95th birthday, Carmichael recalled a day in February 1944 when his life flashed before his eyes while stationed in the Marshall Islands during WWII. On that fateful day, he said, Japanese bombers struck out of nowhere, and during the chaos, Carmichael remembers pulling his helmet down over his ears. 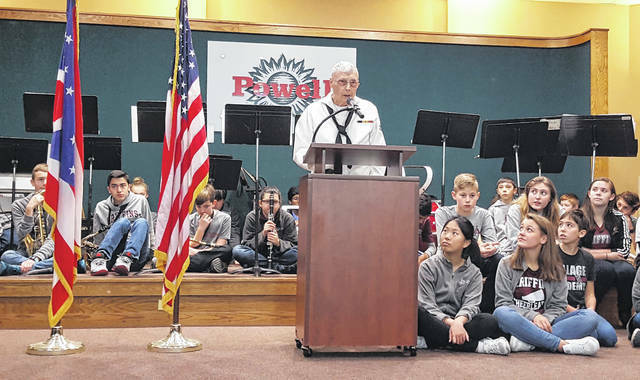 During his welcoming message to those who attended Powell’s annual Veterans Day ceremony, Mayor Brian Lorenz thanked all veterans and current members of the Armed Forces for their service to the country. “Our gathering is just one small spark in the flame of pride that burns across the nation today and every day,” he said. As for honoring local veterans, Police Chief Gary Vest recognized the recent donation of three commemorative bricks that have been placed in the Greater Powell Veterans Memorial located in Village Green Park. The bricks were donated in honor of John Gordon (Navy), Forrest Harry Rosenquist (Army), and all veterans (sponsored by Liberty baseball). Patriotic music was provided by the Village Academy Vocal Ensemble, Village Academy Middle School Choir, and the Village Academy Middle School and Upper School Band.